Sing Out Loud Festival: Enjoy free concerts throughout September! If you love live music but have no interest in paying Ticketmaster prices to see shows, you are in luck! 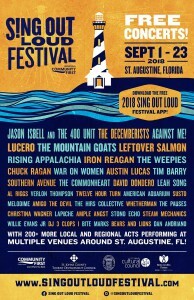 St. Augustine’s 2018 Sing Out Loud Music Festival runs the first four weekends in September and performances are free and open to the public! 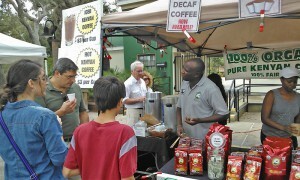 The festival includes concerts at 19 venues throughout St. Johns County including the St. Augustine Amphitheatre, the Ponte Vedra Concert Hall, Colonial Oak Music Park, Plum Gallery on Aviles Street, Bokeh, Dog Rose Brewing, Limelight Theatre, Nobby’s, Sarbez and others.